Following on from the success of the Caithness Arts Drama Festival last weekend, Caithness Arts will be celebrating the originality and vision of the Arts and Crafts in Caithness with two weekends of events for the whole family on 19th & 20th and 26th & 27th September. For the young theatre people in the County, there will be Play In A Day events in Thurso on Saturday 19th and Wick on Sunday 20th . Starting at 10am these will be an opportunity to come along and make a piece of theatre from scratch with no more than a few props, some lights and their own talent. The resulting plays will be performed before a public audience at 3.30pm each afternoon. 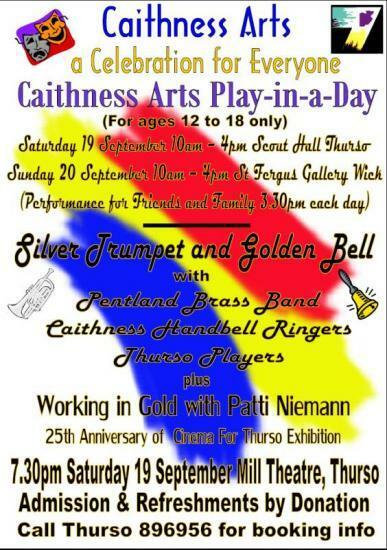 In the evening on 19th September, Silver Trumpet and Golden Bell will be an informal evening of music and conversation at the Mill Theatre Thurso at 7.30pm. With music from the Pentland Brass Band and the Caithness Handbell Ringers and entertainment from the Thurso Players, the evening will include talks on Thomas Telford by Jennifer Bruce and Working in Gold by Patricia Niemann. There will also be an Exhibition Celebrating 25 years of Cinema For Thurso - its Silver Anniversary. This evening will be a chance to talk to fellow artists, crafts people and supporters of the arts about the future for the arts in Caithness. In particular, Caithness Arts are interested to find out what people think the organisation should be focussing on in the next few years. Caithness Arts Open Studios will take place the following weekend on 26th & 27th September. Artists and Makers based in the far north will be opening their doors to give the public a rare opportunity to see inside their working studios. Many artists will be transforming their homes into mini galleries for the duration of the weekend thus providing a great opportunity to view a wide range of work and allow purchasing direct from the artist. A variety of artists displaying an array of creative talent will be involved. From painting to sculpture, jewellery making to pottery, movie editing to glass work, the public will be able to visit the studios of many of our best artists and crafts people. The weekend will also a selection of work from Pulteneytown People's Project Friday Art Class and the exhibitions Now You See It at the Swanson Gallery and New Graduates 2009 at the St Fergus Gallery. Full details of the events including the addresses of artists and their opening times will be available on a flyer, which can be obtained from Thurso and Wick Libraries. A full list will also appear in the Press leading up to the event. For further information and details of all these events or to book tickets and places contact John Cairns of Caithness Arts at cairns.j[AT]virgin.net. Caithness Arts - Open Studio Weekend - 26th/27th September 2009 Caithness Arts is holding an "Open Studios" event, during which Artists and Makers based in the Far North will be opening their doors to give the public a rare chance to see inside their working studios. Many artists will be transforming their homes into mini galleries for the duration of the weekend thus providing a great opportunity to view a wide range of work and allow purchasing direct from the artist.